If you’re interested in keeping a journal but worry it takes too much time, effort or hassle, a journal jar is the perfect solution for you. This hot new trend is the newest version in an old idea– the personal diary. Journal jars are inexpensive and easy to make, and you can choose what to center your journaling on. Plus the whole family can get involved, adding to the fun. One your start your journal jar, you’ll be hooked! Here are some meaningful journal jar projects. You can find all the supplies at Ben Franklin Crafts and Frames in Redmond. 1. Consider centering on something you/your family is interested in (adventure, food, health). 2. Journaling doesn’t have to happen on paper– small pieces of wood, rocks, marbles, movie or sports tickets– can all be great places to journal. 3. Put the jar in a place where you’ll see it everyday. 4. Have fun with it. This is tool for slowing down and appreciating the little things in life OR it’s way to help you focus on goals. This is no right/wrong way to do it. 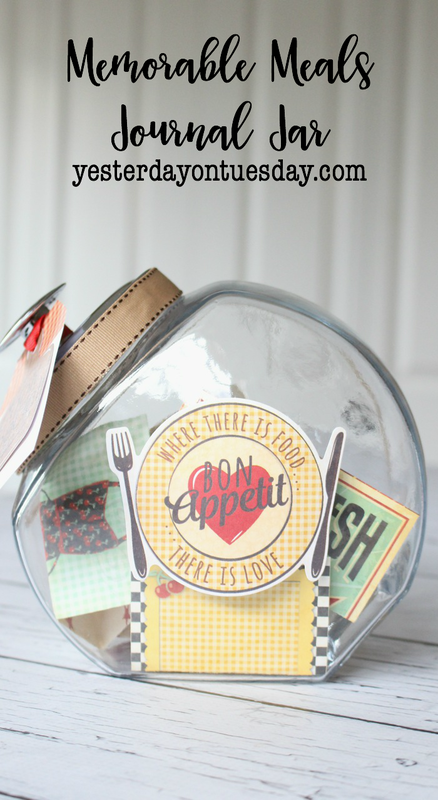 I love the journal jar idea because everyone in the family can participate. As things happen, jot them down on the shipping tags and toss them in the jar. Write the date and event and name of who is recording it. At the end of the year, dump the jar and go through all the big events together. Supplies: Large mason jar, pattered scrapbook paper, plain scrapbook paper, number stickers, ribbon, white shipping tags, scissors and die cut machine at Ben Franklin (use machine for free when you buy the paper there), Glue Dots. 1. After purchasing the paper at Ben Franklin, use the Die Cut machine to make a large scallop. 2. Cut a strip of scrapbook paper 3″ in width and use Glue Dots to attach it to the jar. 4. Attach shipping tags to rim of jar with ribbon. If you like going on adventures or traveling, this is a great choice for you. 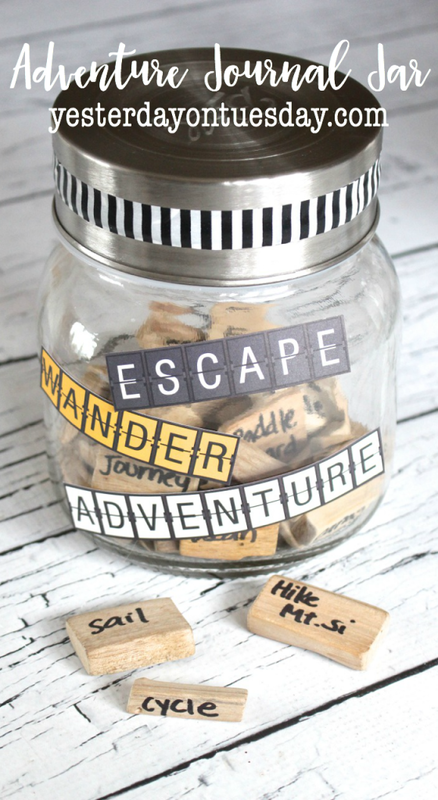 Either you can fill the jar up with adventures you’d like to have (grabbing them as the opportunity arises) or you can write down the adventures as they happen and fill the jar up with exciting memories. Supplies: Large glass jar, scrapbook paper (this is “Arrival” from the Go Now Go line from American Crafts, scissors, Glue Dots, washi tape, wood pieces and a black Sharpie. 1. Add washi tape around the lid of the jar. 2. Cut out words from the scrapbook paper and attach to jar with Glue Dots. 3. Using the Sharpie, write adventures on small pieces of wood. 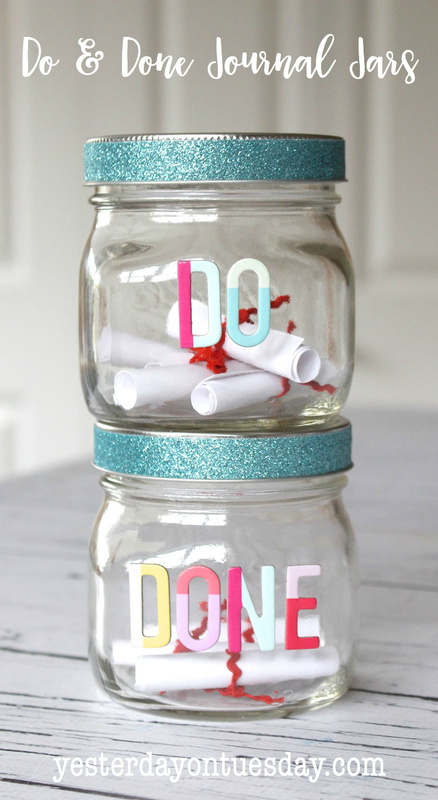 Make goal setting FUN with a set of Do/Done Jars. Also a great idea for kid’s chores! Write the “to do’s” on small pieces of paper and put them in the “Do” jar. Once something is completed, the paper goes in the “Done” jar. Supplies: Two small glass jars, letter stickers (these are “Carefree” from the Thickers line from American Crafts), glitter tape, white card stock, tiny ribbon, scissors. 1. Add glitter tape around the rims of the jars. 3. Cut small pieces of paper and tie them up with ribbon. 4. Add goals or tasks to the “Do” jar. 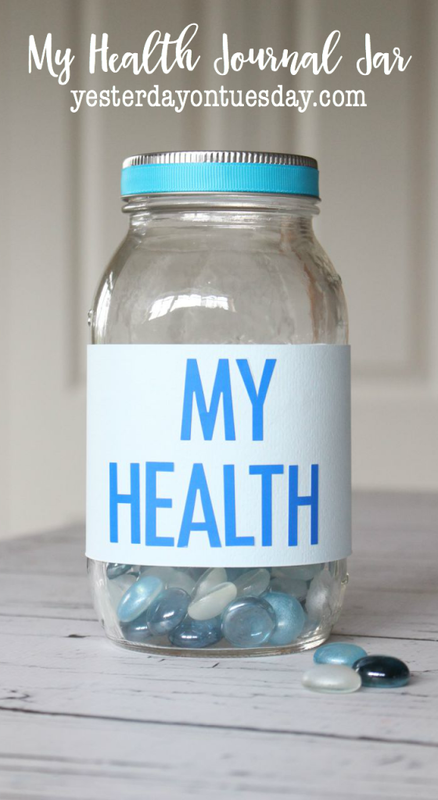 Keep track of your workouts or pounds lost with a “My Health Jar,” it’s a tangible way to help you keep out wellness top of mind. Supplies: Large mason jar, glass gems (these are from Darice), scrapbook paper, scissors, Glue Dots, ribbon and letter stickers (these are “Skinny” from Doodlebug). 1. Snip off a piece of ribbon and use Glue Dots to attack to to lid of the jar. 2. Cut a piece of scrapbook paper 3″ in width and attach to jar with Glue dots. 3. Use the stickers to spell out My Health on the label. 4. Fill the jar with marbles and take on of for every pound lost or workout done. At the end of the month, survey your progress and start again! If you enjoying cooking and/or love eating out, making a Memorable Meals jar is a delicious way to keep savoring your favorite meals. Simply make a note of the date, meal, and who your enjoyed it with, and pop it in the jar. Supplies: Glass “Candy Jar,” Kitchen themed scrapbook paper (this is “Kiss the Cook” from Bo Bunny), Kiss the Cook Noteworthy Shapes from Bo Bunny, ribbon, Glue Dots and scissors. 1. Cut the scrapbook paper into mini journaling cards. 2. Decorate the jar with kitchen/cooking shapes, using Glue Dots to adhere. 3. Add some ribbon around the lid of the jar with Glue Dots. This is an awesome idea for the sports fan or movie buff. Keep tickets as you go to games or shows. On the back of the ticket, write down what happened at the game or if you liked the show. Throw them in a jar as they occur and at the end of the year, dump the tickets out and reminisce about all the good times you had. 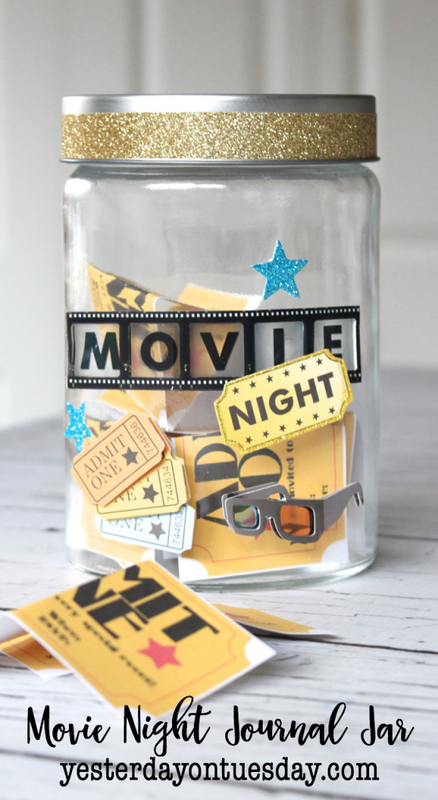 Supplies: Large glass jar, wide gold glitter tape, movie themed stickers (these are from Paper House). Directions: Add glitter tape around rim of jar. Place stickers on jar. Planning a wedding can be a wonderful (and wonderfully busy) time! 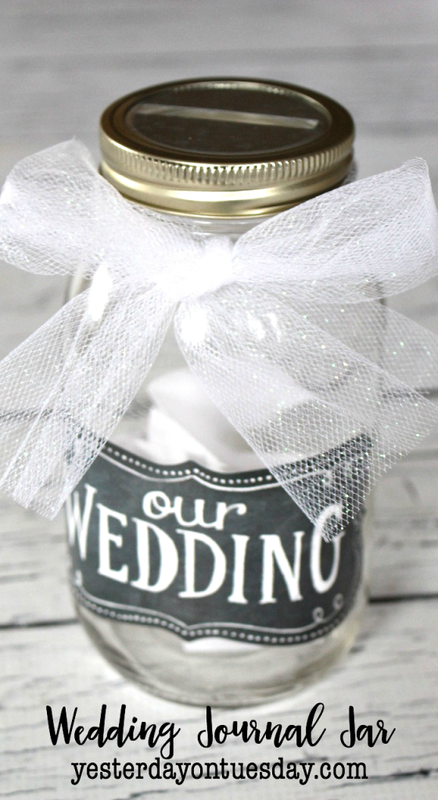 Remember those sweet moments with a “Our Wedding Jar.” Write down romantic things as they happen and read them after the “big day” or on your first wedding anniversary! 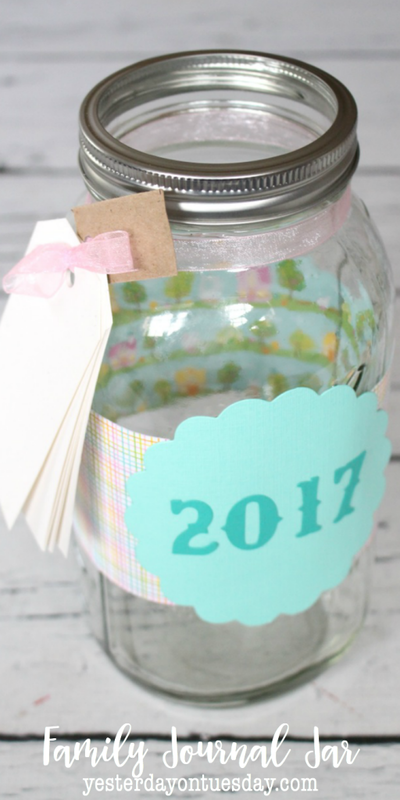 Another idea– use the jar as a place save money for your wedding. Supplies: Large mason jar, slot jar insert (this is from Transform Mason) wedding themed sticker (this is from Sticko), white tulle, white scrapbook paper, scissors. Directions: Tie tulle around jar. Add sticker to jar. Cut up 2″ by 3″ rectangles of white paper for recording memories. Love glass jars? me too! Here are more Great Glass Jar Ideas.